Where is Your Next Scuba Diving Adventure? Scuba diving Phuket – The Thailand’s Andaman Sea and Phuket Island has much to offer to scuba diving lovers. There is a wide range of exhilarating diving sites offering underwater exploration for enthusiasts of recreational scuba diving or even technical, whatever their level of scuba certification or diving experience. Phuket diving – with over 1,000km of coastline, the diverse environment of diving in Phuket Thailand is phenomenal, encompassing everything from extensive fringing reefs to deep drop-offs and wrecks, dramatic granite walls, caves and tunnels, coral covered pinnacles, and open ocean seamounts. Scuba diving in Phuket Thailand is undoubtedly a world-class diving destination and a paradise for scuba divers. PADI Open Water Certification Course. Phuket diving Thailand – The islands and beaches of Phuket hold the greatest appeal for scuba diving enthusiasts. Whether you’re looking for Phuket diving day trips, diving in Ko Phi Phi & Racha, there is plenty of choices. The Thailand’s Andaman coastline, boasts fabulous scenery, dazzling beaches and breath-taking underwater experiences for scuba divers. The largest and most well-known of the islands is Phuket, the “Pearl of The Andaman Sea” which has attracted tourists and those passionate about scuba diving in Phuket for a number of years. Phuket is also the largest hub of scuba diving in Thailand and the main base for Similan Islands Liveaboard diving. The best season for scuba diving in Phuket, Racha and Phi Phi Islands as well Similan Islands is between October and May. Though for diving day trips, you can dive all year round in Phuket. Phuket diving day trips – Phuket’s offshore dive sites are mostly to the East with Phi Phi Islands and South with Racha Islands (a.k.a Raya), and can be reached daily by our yacht MV Mermaid between 2 and 2 ½ hours. They are all well worth the journey, but two in particular – Shark Point and Anemone Reef stand out as being special in terms of the abundance of marine life. In the area don’t miss the most exciting wreck diving at King Cruiser. Further south, the coastline at the Phi Phi Islands offers shallow fringing reefs around impressive limestone formations – ranging in size from underwater pillars to whole islands. Some of the best dive spots in Thailand are to be found here – Hin Daeng and Hin Muang, however, by their remoteness, they are reachable only by private dive trip. All the superlatives are not enough to describe the extraordinary beauty of Phi Phi Islands’ dive sites. Sundays are our special Phuket diving day trip. We are going to the most exciting dive spots: Anemone Reef, Shark Point, and King Cruiser wreck. It’s our specially crafted dive trip for experienced SCUBA divers. In 2018, All 4 Diving Phuket received the prestigious PADI Award for 20 Years of Outstanding Education & Service. All 4 Diving was founded in 1995 and we are now internationally recognized for our high standards of safety, quality, professionalism, and service. Today, All 4 Diving Phuket is the most complete and the best PADI 5 Star Career Development Center (CDC) of South Thailand with the resident Platinum PADI Course Director – Nicolas Bergere. PADI Learn to Dive and scuba diving Phuket programs are our area of expertise and passion. 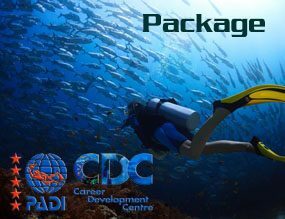 The 5 Star CDC rating is only given to the world’s leading PADI diving centers, which have demonstrated exceptional capabilities in managing all level of diving courses while respecting standards, high levels of safety and outstanding customer service. These dive centers must also meet the highest requirements for training PADI Professionals and offer career-oriented programs to prepare scuba diving professionals for employment in the dive industry. With worldwide recognition in the Phuket’s scuba diving industry, All 4 Diving Phuket Thailand is also fully involved in environmental programs with local and national authorities. We are an active member of the PADI Project AWARE, Shark Guardian and Go Eco Phuket. Our philosophy is to protect the environment for future generations. As scuba divers, we are the Ocean’s Ambassadors. Dive briefing on our Phuket diving day trip yacht MV Mermaid. Why choose All 4 Diving Phuket Thailand? All 4 Diving – Your best partner for scuba diving in Phuket, PADI dive courses and Similan Liveaboard diving. All 4 Diving is the most complete and highly awarded PADI 5 Star CDC Dive Center in Phuket. We thrive to provide the best scuba diving Phuket trips and a top-notch PADI divers education in a safe, fun and friendly atmosphere from beginner to professional scuba diver level. We have everything on hand. We are the only PADI 5 Star CDC Dive Center in Phuket with its own on-site private training pool, specifically designed to reach the highest standards of PADI teaching and diver training. Our large retail dive shop, located in the heart of the famous Patong beach Phuket will offer you a full range of high-quality scuba equipment and accessories. Our experienced multilingual team of PADI Elite awarded Instructors will teach and guide you through the most amazing dive experience in Thailand. With our own dive yacht, MV Mermaid, All 4 Diving has certainly the best dive vessel in Phuket on which the safety, service, and comfort are paramount. Equipped with modern air-conditioned classrooms, you are in the right place to learn how to dive, take a PADI continuing education course or simply enjoy our Phuket diving day trips. During the high season we offer a wide range of Similan Islands Liveaboard diving, make sure to book your Similan Islands dive trip in advance with us for better deals. Do not hesitate to contact us for any information about our scuba diving Phuket trips, PADI dive courses, or if you are interested in Similan Islands Liveaboard diving trips. PADI courses with The #1 Scuba Diving Phuket Center of South Thailand. All 4 Diving – Why chose Phuket for your PADI courses? – Simple. The water is clear and warm and filled with exciting adventures and marine life to meet and explore during your scuba diving Phuket holidays. Golden opportunities arise all year round and your PADI courses will be safe, fun and relax without the hustle and bustle of city life. Great training facilities, warm waters, complemented by a diversity of marine life are all readily available in a picture-postcard destination. This is one of the world’s top places to learn to dive, continue learning or even start a scuba diving Phuket career based on one of the fastest growing recreational pastimes that scuba diving is. Scuba diving is not something that can be self-taught. A correct instruction is essential and standard safety practices need to be applied and upheld throughout, no matter the size of the operation. We implement and emphasize those practices in our dive center. With All 4 Diving Phuket, for all recreational PADI diving lessons, you benefit from a PADI Elite awarded Instructor and free private diving insurance. Scuba Diving Phuket Thailand – Family friendly! As the interest and participation in scuba diving is on the increase, images of black rubber-clad men immersing themselves in the abyss, whilst groups of ladies anxiously look on, are thankfully a vision of the past. Nowadays the ladies are more likely to be scuba diving buddies! Diving couples have been coming to enjoy the tropical waters here for quite some time, and the kids are not left out at all. PADI dive courses – Now Kids can scuba dive too! PADI Bubble Maker and Seal Team, give boys and girls aged eight years upwards the opportunity, under professional guidance, to enjoy an exciting scuba diving experience whilst learning some cool underwater tricks into the bargain. Bubblemaker program takes an hour or two, and Seal Team program lasts 1 to 3 days in the safe surroundings of a swimming pool, and are a great way to get the youngsters hooked, either with or without their parents in tow! These fabulous PADI scuba diving introductions to the underwater world are a great way for kids to share valuable learning experiences. In the heart of The Andaman Sea, towards the northern end of the Phuket coastline and west of Khao Lak – Lam Ru National Park, a series of granitic outcrops lie in deep, clear water with reefs descending to 25-35m and beyond in depth. These are the Similan Islands, and further north you’ll find Koh Bon, Koh Tachai and the famous Richelieu Rock whose breathtaking underwater scenery and diversity of marine life have gained them a considerable worldwide reputation in the scuba divers’ community. Given their proximity to Phuket Island, it is not surprising that these groups of islands are among the country’s most popular destinations for scuba diving, whether as a day trip or on a Liveaboard diving holiday. The Similan Islands is a series of strikingly beautiful granite and jungle islands with some stunning beaches and great undersea diversity. The water clarity and healthy reefs make these islands the focal point of regional liveaboard diving. Varied and full of color, the southern islands are numbered one through nine. These numerous islands are balanced by the large northern islands of Koh Bon – a beautiful piece of limestone, Koh Tachai, which has attractive sandy beaches, and one of the world’s top scuba diving destination – Richelieu Rock. There are several great Liveaboard diving destinations in Thailand. But due to its location and diversity of marine life, nothing beats the Similan Islands as a Liveaboard diving destination. Scuba diving here normally originates from Phuket and is done by Similan Liveaboard diving boats running anywhere from two days to two weeks of scuba diving trips. The Similan Islands with Koh Bon, Koh Tachai, and Richelieu Rock can certainly lay claim to being one of the world’s top Liveaboard destinations. The dramatic underwater terrain is highlighted by thriving reefs and abundant soft corals, and the tremendous diversity of marine life includes many of the more exciting, larger pelagic such as Manta Ray and Whale Shark. Whether animal or vegetable, all life form comes from the ocean. It is established that we have the same percentage of salt in our blood. The ocean is part of us. We must respect it. When we return to him, whether to explore him, to swim, to scuba dive or to sail, we make a return to the sources. Our future depends on that of the ocean. Yet for all of our reliance on the ocean, 95 percent of this realm remains unexplored, unseen by human eyes.